One of the perks of celebrating my big birthday in Kansas with Kansas was getting a celebratory ice cream pie from Sylas & Maddy's!! I don't know why I can't find one of these here in New York, it's absolutely delicious, and gets rid of the need for cake-nobody really gets ice cream cake for the cake any way! Disregard the ice on it, that's what happens when something's been blast-frozen and you don't let it warm up a bit in a regular freezer. 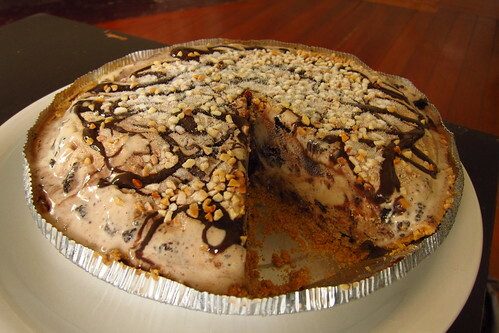 Graham cracker crust and Maddy's Mud ice cream (chocolate ice cream with peanuts and Oreo pieces). Could you blame me for not letting it hang out in the freezer for a few minutes? That would have been torture. Plus, it was my birthday and I'll do what I want! 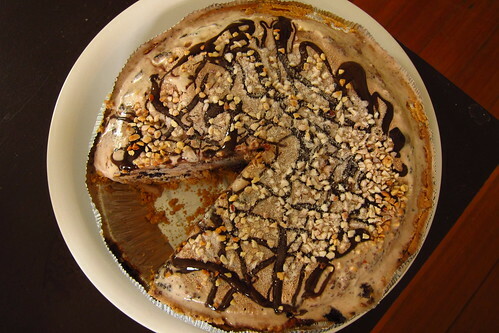 Quality Meats serves their ice cream cakes through the end of August. It's a great alternative to this pie!